HI: Please forgive my lateness. 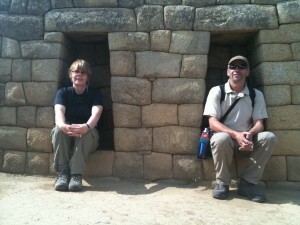 I have just returned from Peru where I was hoping to be able to get more work done. Unfortunately I had many technical difficulties- but now I am home and can dig in. I am currently on leave from my job as a junior/senior high math teach in a small rural school in Southern Alberta in order to take my 5th, 6th and 7th MET courses this term. I have thoroughly enjoyed the journey thus far, and expect it to continue to be an amazing year. Since graduating from UBC with a B.Ed I have taught English and Science in Nigeria, ESL at Okanagan College, Adult Upgrading at Lethbridge College, established both and adult literacy program and family literacy program in my community, and now have been teaching Math and Language Arts in the public system for 11 years. I have been married to the same wonderful guy for 31 years ( I was just a baby when I married!) We have three great kids. Our last child has just graduated from high school so now we are officially empty nesters, which is bitter sweet. We love to travel, hike, ski, kayak and camp. Now that our children are finished school we would like to work overseas. I am hoping that having my MET will give options. I am excited about this course and look forward to what ever comes my way!